Pets on Spirit Tales can be obtained by capturing any of the wild monsters across the game. Players can even capture the monsters inside dungeons and special events. These Pets will then be available to use as battling partners or they can merge with the player in order to provide them with buffs. All the different Pets come with their own skills and stats. 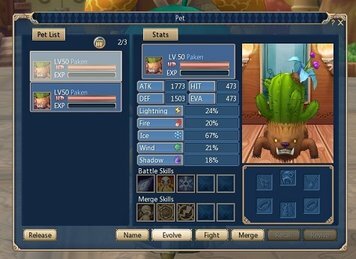 Pets can be evolved too from the Pet interface. Pet evolution requires another Pet to use as a catalyst, which will get consumed after the evolution. After the evolution a Pet's level will drop to 1, although it is likely to gain a star, this will increase its growth speed and make it more powerful at max level than it could be before.